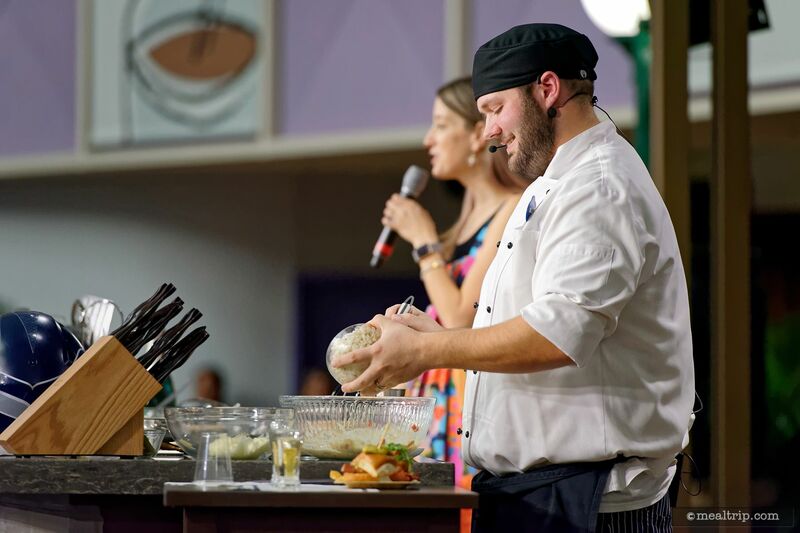 There's no telling if this cool little pop-up event will be around after the 2018 Food and Wine Festival has ended, but it's such a cool little surprise event, I wanted to add it to our database! 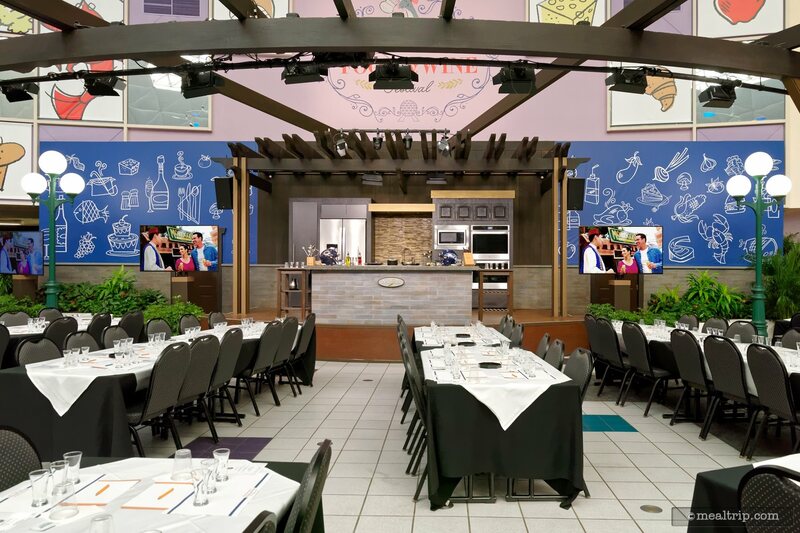 This complimentary event is held at Epcot's Festival Center in the Culinary Demo area and combines three food samples with three "adult" beverage samples (sodas are available for those under 21). As far as we know, the event will only be held on September 10th, 17th & 24th and October 1st, 8th, and 15th from 4:30pm - 5:15pm. Because of high demand, you will need a wristband to get in — and wristbands are distributed starting at 9am at the Festival Center Check-In Desk. Everyone in your party must be present to pick up a wristband (and they go pretty fast… if you really want to go, you need to be in line at 9am). 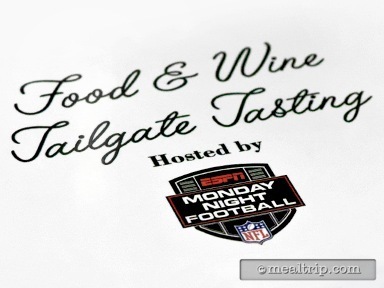 I had a chance to experience the new (and probably temporary) Tailgate Tasting at Epcot's Food and Wine Festival on Monday, September 17th, 2018… and you know what? It was pretty cool actually! 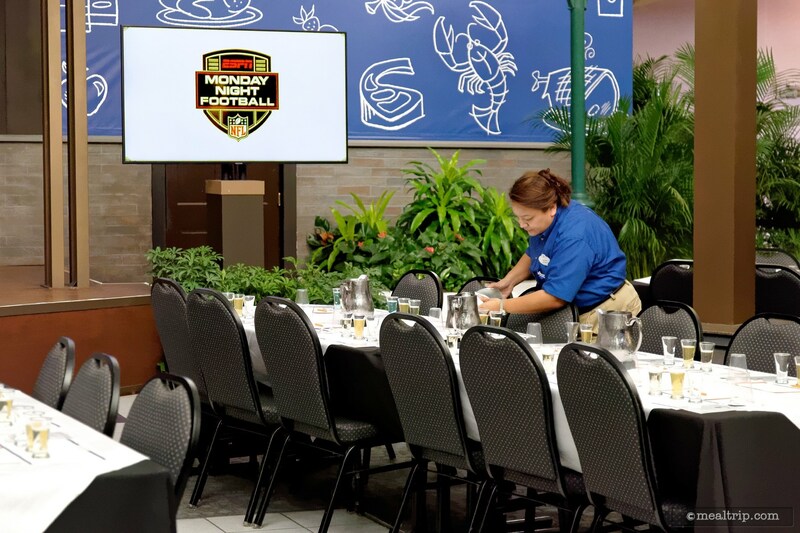 The limited-time, complimentary engagement which takes place on select Monday's only — pairs a very small amount of football, with three food and three beverage samples that are somehow related to the football teams that are playing in that night's big game. The event only ran about 35 minutes, but that felt about right. 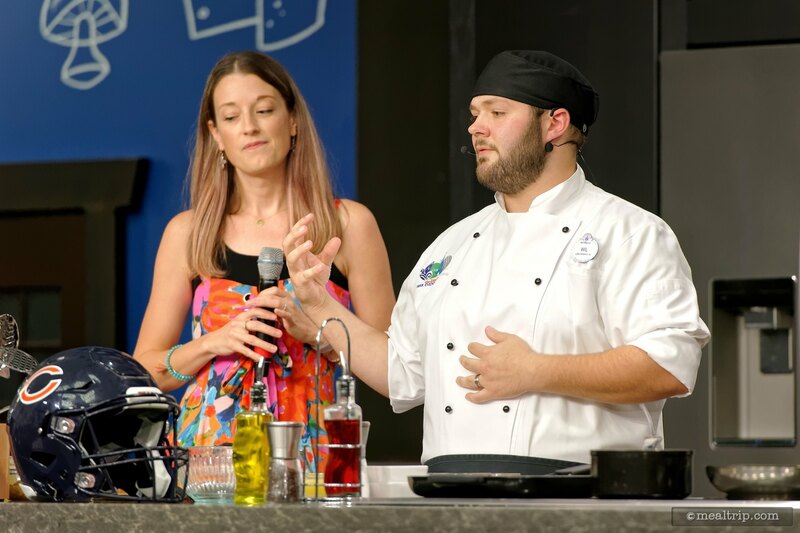 Unlike a Culinary Demo, Beverage Tasting, or Mix It, Make It presentation, there are no recipes to follow along with… and no real product information… there's just a couple of tasting notes (why a certain beverage matches the food item), and a couple cooking notes (because tailgate food usually isn't very complex to begin with), and finally some background information on the culinary significance of the cities from which the teams that are playing that night represent. Whew. 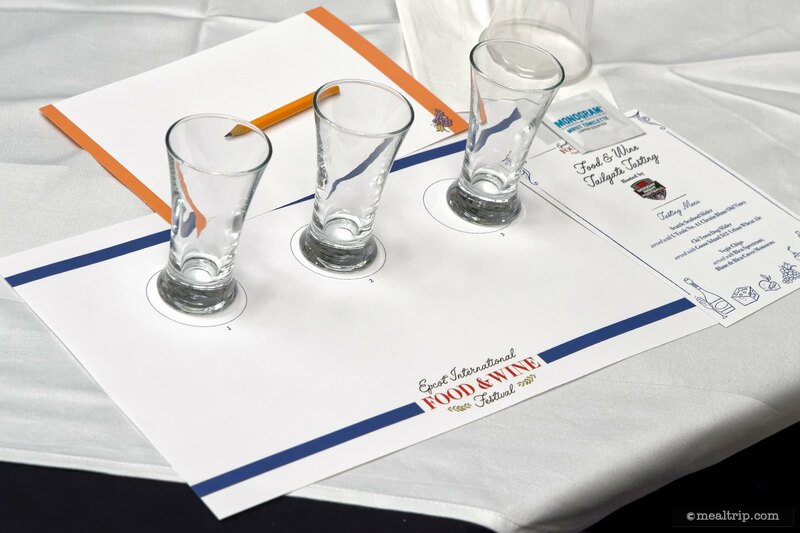 Although complex to explain, it all makes sense once you're at the demo, sampling the three food and drink items. The drink samples are poured before guests are let into the area. About five minutes after everyone is seated, they start bringing the food samples out. 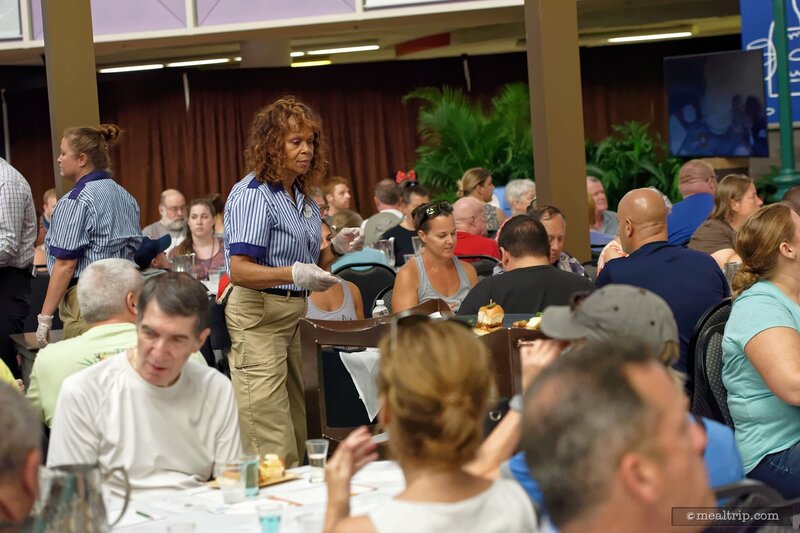 There are 150 guests (give or take) and they generally work the room from one side to the other, so it may take 10 or 15 minutes before everyone gets their food samples. 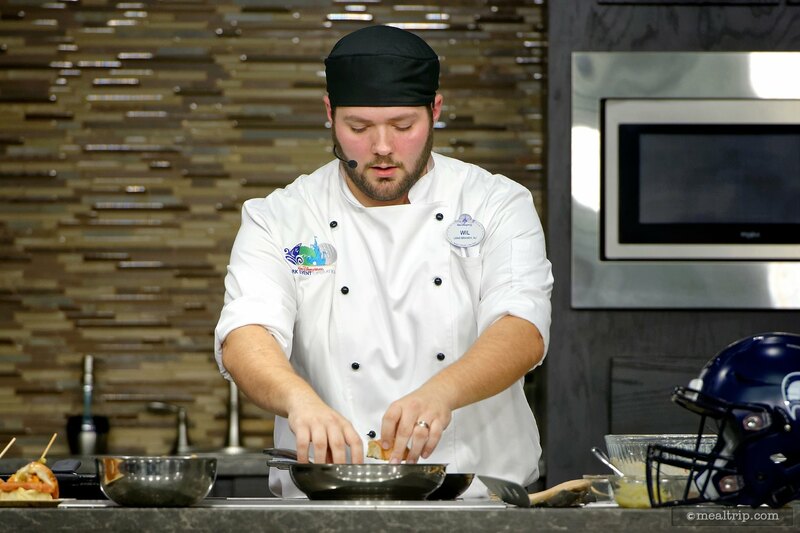 All three of the samples are served on one plate at the same time. 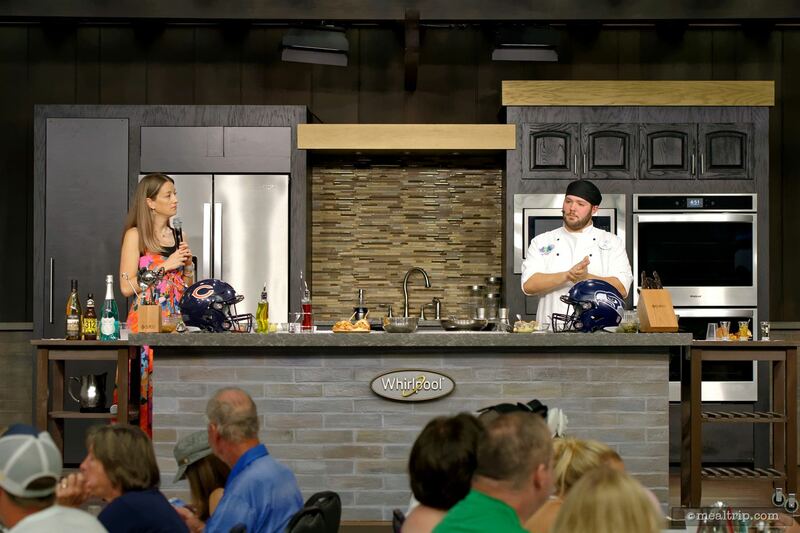 The presentation didn't really feel "led" to me, as in — there's no real invitation to start eating, or specific information about the food and beverage pairings per say. It's kind of a "sample amongst yourselves while the presentation is going on" kind of thing. 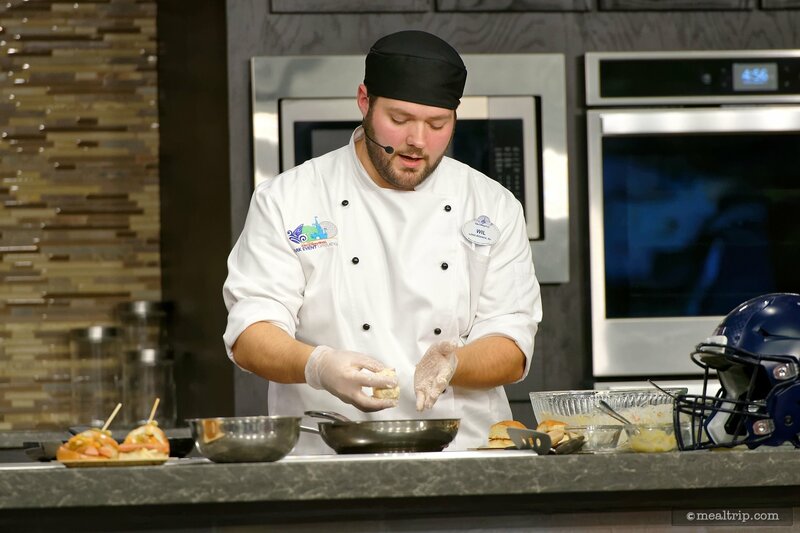 There is some information about why the items you're drinking and eating were chosen, and the chef does make each of the food items as you're eating them, so that's cool — but it's really light background information and not a "learning moment" per say. 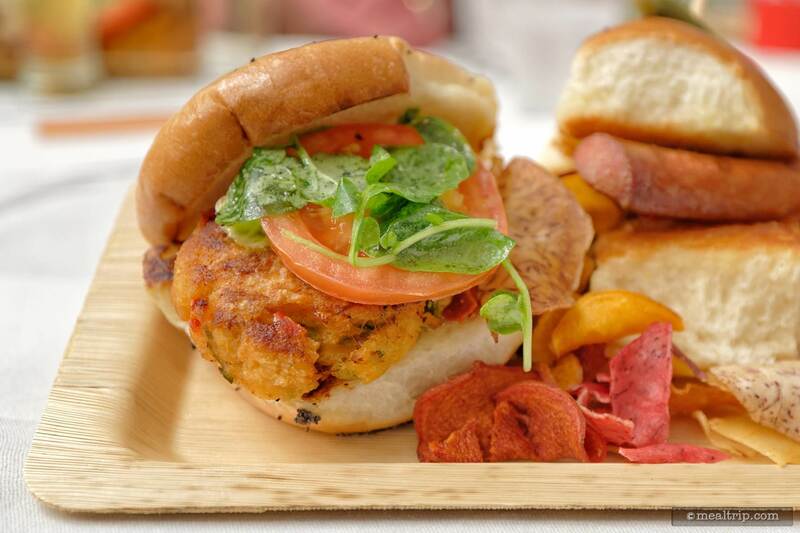 On the day I visited, we had a Seattle Seafood Slider, the "patty" was basically a crab cake, so it was the star of my plate! 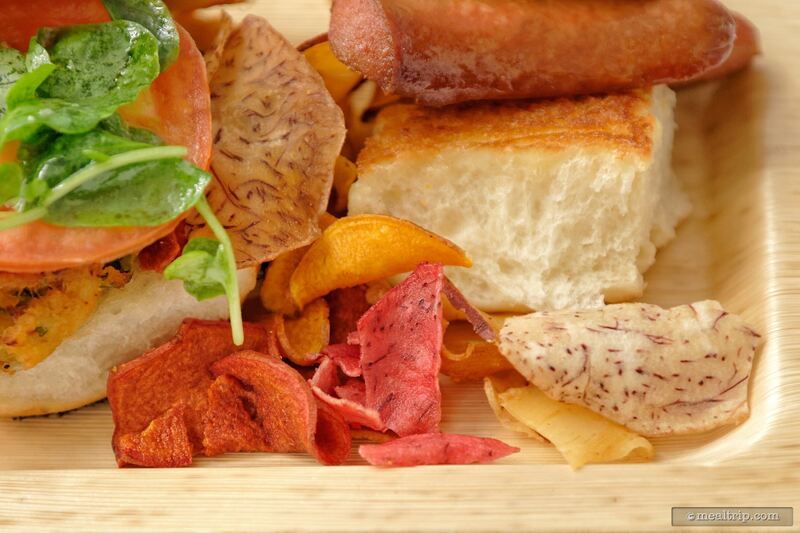 The second item (which I suspect will always be more like a "side item" to bridge the gap between the two sliders), were some colorful "Veggie Chips". There's nothing crazy complex here, but they were fresh and really... it's not something that most of us would do at home. The third item on the plate was Chi Town Hog Dog Slider. The relish on this one was crazy good, and the toasty slider bun was pretty fantastic as well. I know Hot Dog sliders are a thing, but I've always struggled a bit with how to eat them… everything wants to slide out! In fact, they put a little wooden spear with a tiny pickle right through the middle of this one to try and hold it all together (the pickle was pretty good too). 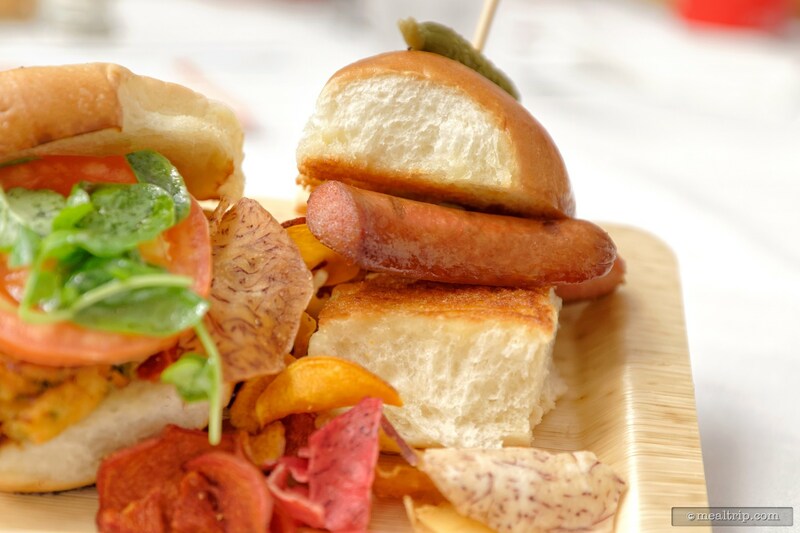 Be sure to check out our photo of the Hot Dog Slider they made up on stage… it shows what all is in there better than the sample that was on my plate. 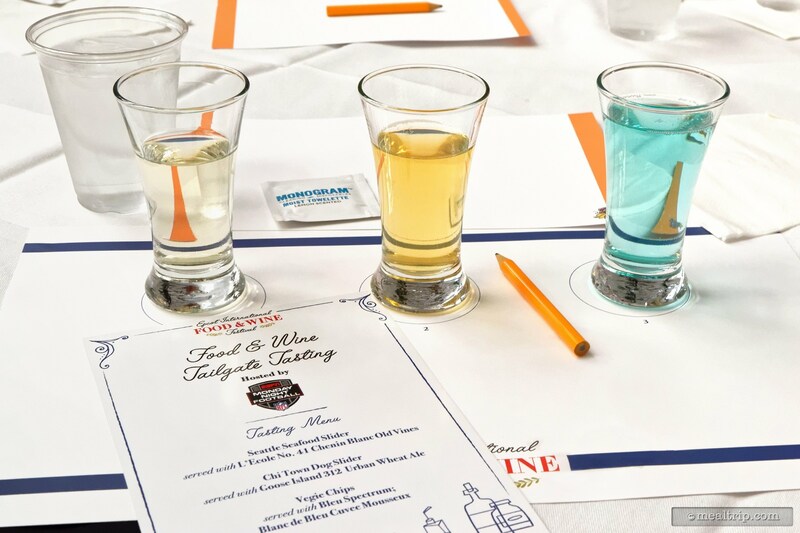 The three beverages we sampled with the items were a traditional wine, a beer, and a sparkling wine. I'm guessing these were around 4oz pours of each beverage (cans of soda are also available for those guests that are under 21 or if you would just rather have a soda). The wine was an L'Ecole No 41 Chenin Blanc, the beer was Goose Island's Goose 312 Urban Wheat Ale, and finally the sparkling wine was Blanc de Bleu® Cuvee — which is a dry and crisp California sparkling wine with an added hint of blueberries. 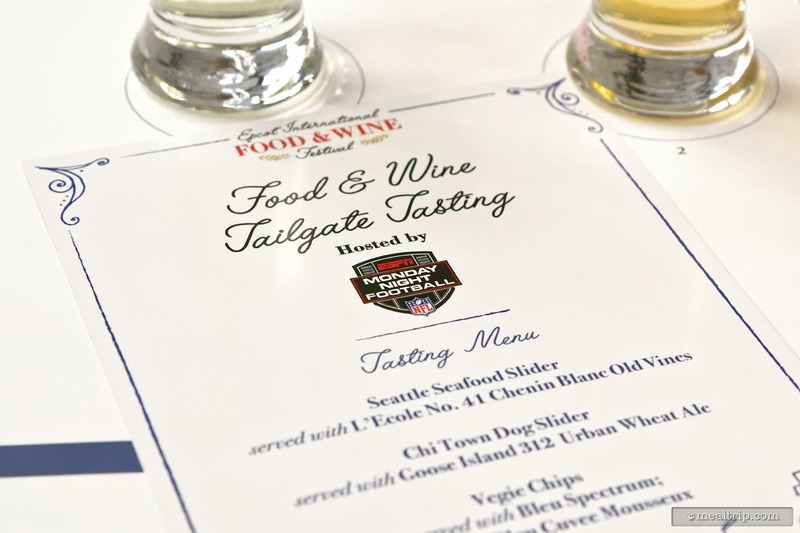 If you would like to attend the Tailgate Tasting event there are a few days left for 2018. Those dates are Monday's only — September 24th, 2018 and October 1st, 8th, and 15th, 2018. The event starts at 4:30pm and runs between 35 and 45 minutes. The only thing is — while the event is free to attend, you need a wristband to get in — and they start handing out complimentary wristbands at 9:00am inside Festival Center. All members of your party must be present to pick up a wristband. If you're going to be at Epcot all day anyway — it's a great little pop-up perk! The only caveat here might be the timing… Festival Center is a bit out of the way, so if the timing doesn't interfere with something you've already booked, it's a totally cool thing to do in Festival Center!